Bill Caldwell and Tom Heifner pick me up at 8:00 AM and we head out for the Dayton Hamvention. Bill is the driver, Tom the navigator, so I automatically become the mechanic (if needed) on this trip. 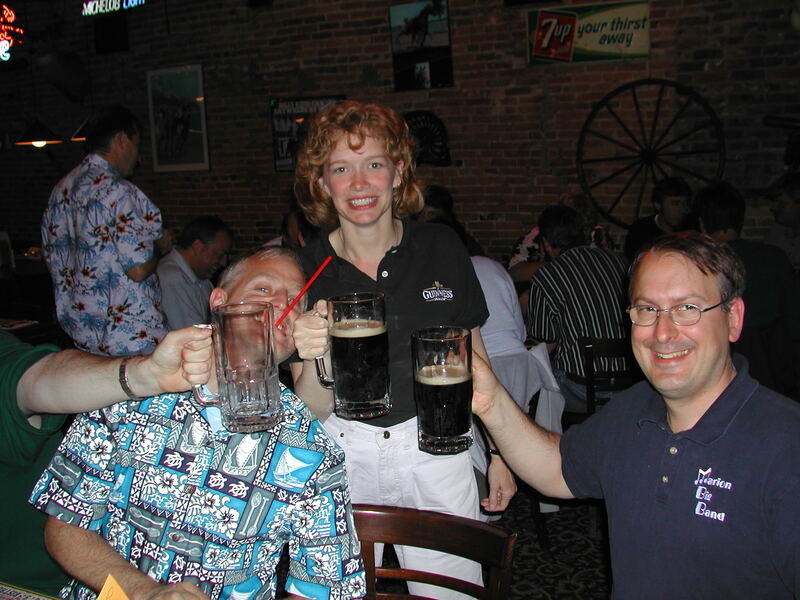 It’s a team and we have every expectation of another great time at the nation’s largest hamfest. Brian can’t go but he willingly puts forth is long stretch van to haul all of the groups flea market items. Our first stop for gas is in Walcott and we aren’t even out of the state yet. Tom says gas is high in Illinois and we are making about 10 mpg. We had run out the front tank (the van has two gas tanks) on the go and the engine died. Bill quickly switched to the other tank and the engine restarted. We gas up again at Crawford, Indiana (jct. of I-74 and Indiana 32). We run on the second tank to the Dayton, Ohio Days Inn located at the junction of I-70 & I-75. We drive over to the Walmart to get some ice and the rear tank runs out of gas just as we enter the Walmart parking lot. We switch to the front tank, buy the ice, and then gas up the rear tank. The book, found in the glove box, says it holds 25 gallons but we can only squeeze in a bit over 19 gallons. We looked under the van and quickly found out the reason for the diminished capacity – one end of the tank is caved in! We eat dinner at the Mexican restaurant next to the Days Inn. We are up early and have breakfast at the Days Inn and by 8:00 AM we are over at the Dayton University dorms to check in. Bill, the room czar, has to make room assignments for the rest of the radio farm group due to arrive today. That completed, we loaded up and drove over to the Air Force Museum arriving just as it opened at 9:00 AM. Things were so going well that no one gave it a second thought when the van was a bit slow to start this time. I went to the 11:00 AM showing of the IMAX movie on the space station. One minute into the show the projector broke down. The arc lamp went out and refused to restart. After 20 minutes, they gave up and refunded everyone’s money. We spent the rest of the day touring the museum until it closed at 5:00 PM. When we left the museum this time we did notice the van was slow to start. But we drove to the dorms and found the rest of the radio farm crew. The announced plan for the group was to “load your flea market items in the van and at 6:00 PM we are going to drive it to the Hamvention flea market and park it in stalls 2044/45. Mark & Heidi Godfrey will pick us up and we all meet at Young’s Dairy for dinner. The van won’t start so Mark jumps it and off we go to Hara Arena. As we approach Hara, Mark stops for ice to put in the Van’s cooler overnight. We stop just outside the east entrance of the flea market and leave the van running – thinking we were charging the battery. Mark arrives with the ice moments later. While icing the water chest at the back, I sensed the van idling to slow slightly. Bill runs forward and just as he gets to the driver’s seat, the van dies and won’t restart. Mark pulls along side and we jump the battery. 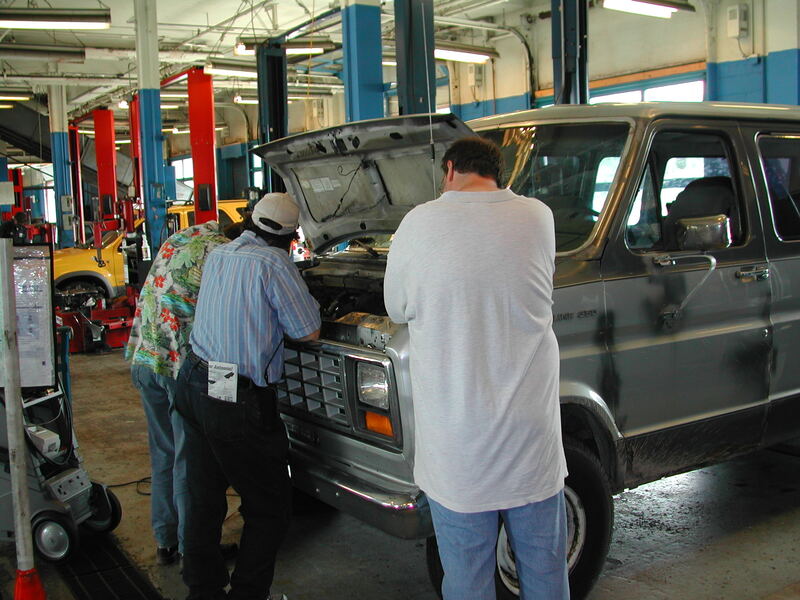 It takes a good 10 – 15 minutes before the van will start. We are thinking “battery is really dead – probably have to get a new one”. We park the van in our flea market stalls and then head out to dinner with Mark and Heidi. Upon returning to the dorm after dinner, we let the rest of the crew in on the van problem. As usual, there is no shortage of solutions offered. But we have two whole days to figure out what to do. So we party with old and new friends until midnight. At 6:30 AM we are up, showered, and leaving for “The Breakfast Club” restaurant for a 7:00 AM breakfast. The Breakfast Club is our favorite as is Young’s Dairy so we have settled into a routine of eating at these places. By 8:00 AM we are at Hara Arena just as the flea market opens. Gary Bishop puts up the sun-shade and the selling (and buying) begins in earnest. In the afternoon, we use Jeff Woods’ digital voltmeter to check the van’s battery. Voltage is low. Consensus is the battery probably has a shorted cell. We called Bryan on the phone and the discussion didn’t change the prevailing opinion. We continued to enjoy the Hamfest. Tom Farland, N0J?? from Fredericksburg, Iowa hauls us back and forth. Also this day Gregg and Eric Lind and two others take the amateur exam and all pass. Four new hams added to the gang. In the evening, Barry Buelow gave me a ride to the Collins Collectors Association Banquet in his new bright yellow Corvette. The banquet was at the Marriot at Fairborne (near Wright Patterson AFB). Talk about arriving in style! Ray and Dorothy Adams from Rockwell Collins Melbourne, Florida gave me a ride back to the dorms at the conclusion of the party. It’s the same routine again – up at 6:30 AM; The Breakfast Club at 7:00 AM and off to the Hamvention. It’s cold and raining. The flea market is a disaster. Later in the day a few guys open up the van and start selling. But there are very few customers and we shut down at 4:30 PM. 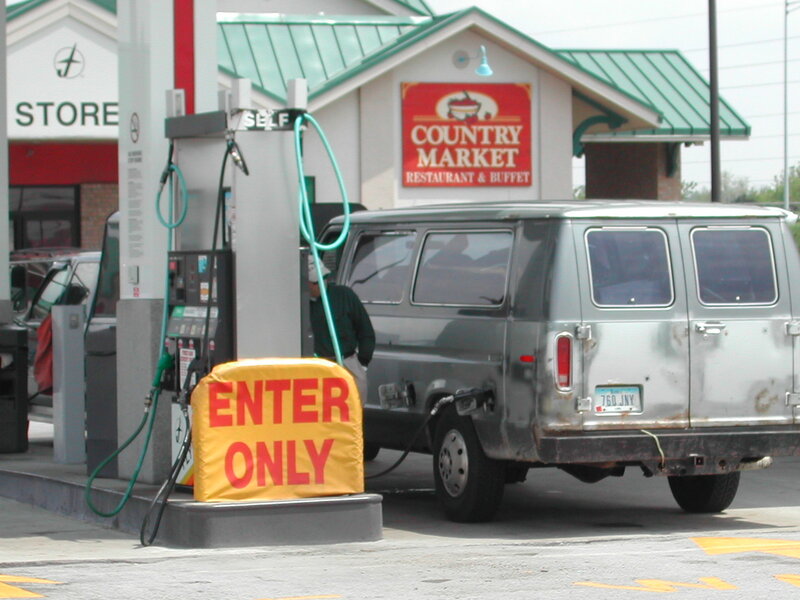 Because of the flea market layout, there was no chance to get another vehicle in close enough to jump the van. 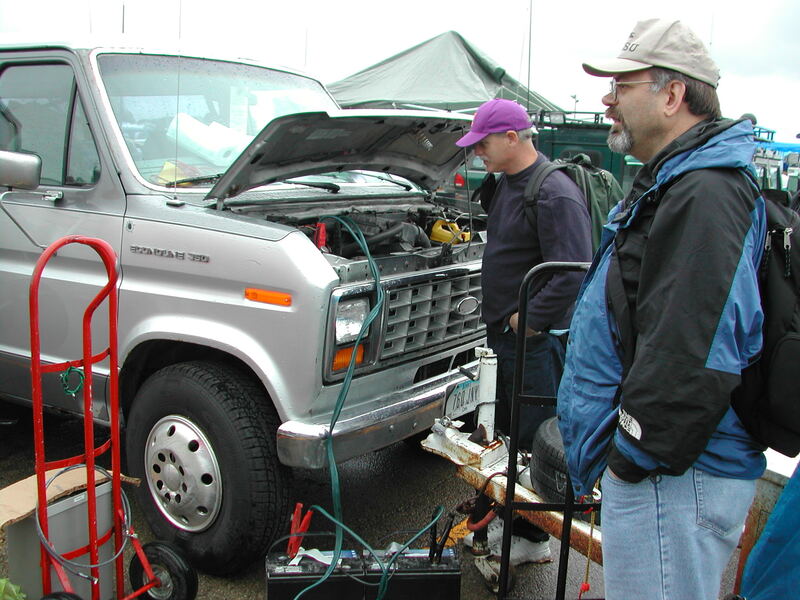 Jeff Woods had two 6-volt deep cycle batteries so we put them in series and jumped it to the van battery. After charging for 30-minutes, the van started. During the charging operation, Bill and I scoured the flea market for a power supply and an extension cord so we could charge the battery at the dorm. Sometime during this exercise, we decided the van’s battery was probably OK and the alternator likely bad. We decided any money we spend should be toward a permanent rather than a temporary fix. When we returned, Jeff agreed with this analysis and had found a telephone book. He called a Sears Automotive Shop number (listed at Brookville, Ohio) and they said they were open until 7 PM and would fix the van. Bill and I start the van and head out for Brookville with Jeff Woods, Jack Kovar, and Fred Spinner following behind in Jeff’s suburban. We arrive in Brookville (about a 20 mile trip) and cannot find Sears. Bill stops at a gas station and learns there is no Sears in Brookville! A customer says the nearest Sears is back at Salem Mall – near the Hamvention! All this time we keep the van running while monitoring the battery voltage with Jeff’s DVM connected to the cigarette lighter socket. It’s reading 10.6 Vdc when Bill returns from the gas station interrogation. We jump back on I-70 heading back to Dayton while I call Jeff on the cell phone with the info on Sears. He looked up the Sears “Brookville” phone number Jeff called and dialed it again on the cell phone. The clerk confirmed we were talking to the Sears store at Salem Mall. To this day it’s still a mystery why they have a phone book listing for Brookville, Ohio. On the trip back, I check the voltage every few minutes. It’s “touch and go” as the voltage with each check is about 1 volt less than the previous check. We are finally on SR49 and still about 3 miles from Salem Mall when I inform Bill we are down to a battery voltage of 7.5 volts and probably very close to finding the minimum voltage necessary for the ignition operation. Bill announces he had no turn signals on the last lane change. Suddenly the traffic light ahead turns red and Bill applies the brakes. The brake lights coming on are the final straw and the engine dies as he stops at the light. Not even a click from the starter solenoid is heard. Luckily we are on a slight decline, so when the light turns green, we slowly rolled around the corner and onto the shoulder. We call Jeff with the news. We are at the intersection of SR 49 and Union St. We unload Jeff’s two 100-lb 6-volt deep cycle batteries (to this day I don’t know why Jeff had them), connect them in series and then across the van battery. We wait some 15 minutes before Jeff, Fred, and Jack arrive and pull the suburban up nose to nose with the van. During this 15 minute interval, I remark it’s too bad the deep cycles weren’t 12 V batteries, because we could put one in where Bryan’s second rover battery usually resides. Then we both realized we could in effect do that by putting the two 6 volt series batteries between the two front seats and running the jumper cable out the wing window and under the hood to connect across the vehicle’s battery. We had just completed this task when the boys arrived. The van still didn’t have enough battery to turn over the engine. Time is running short now for getting to Sears before they close – it’s about 6:30 PM. Jeff has jumper cables so the suburban battery is also connected to the van and in a couple minutes the van engine spins over and starts immediately. 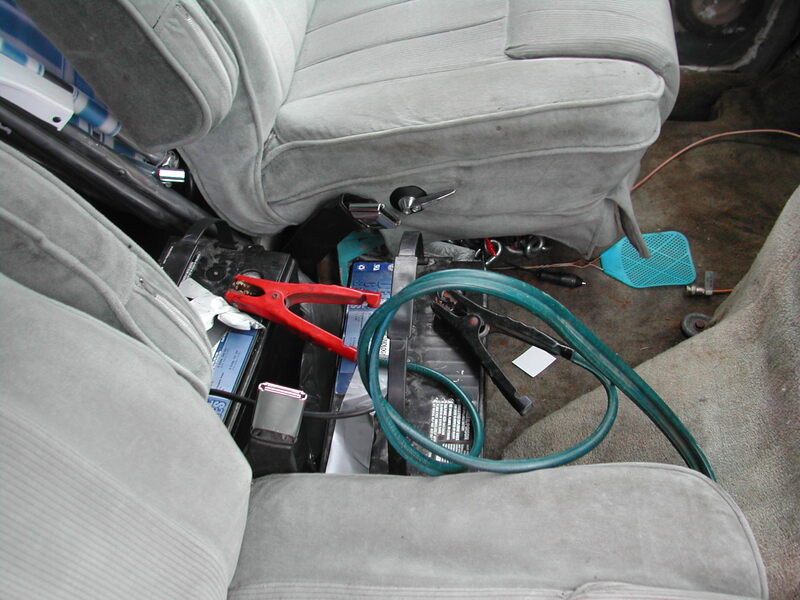 I’m checking voltages at the cig lighter socket as they remove cables from the suburban. The engine still runs and the voltage is about 11 volts. We’re going to make it! 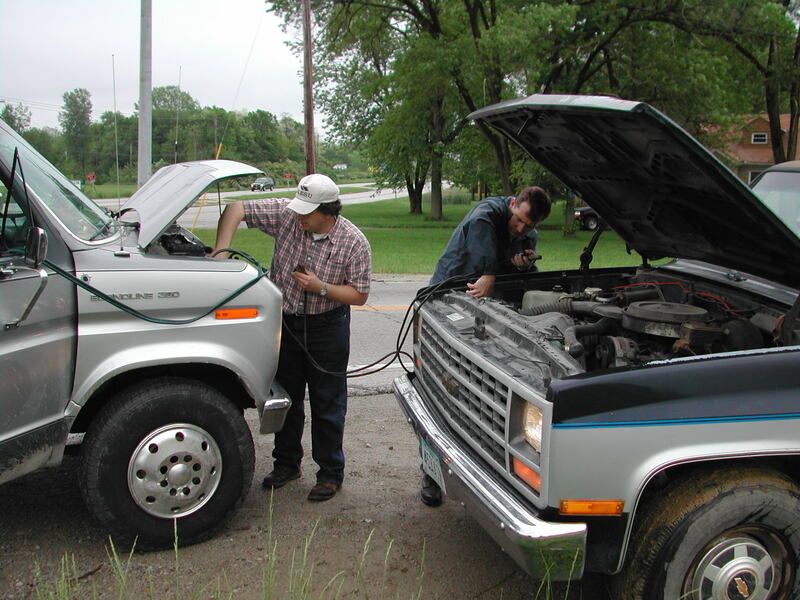 Bill and Jack arrange the cables and close the van hood. Jack applies some duct tape from the center hood to the van grill amid several jokes about how proud Red Green would be of us. Bill jumps in and off we go. A couple minutes later, the thought crosses my mind that we probably are going a little fast (about 45 – 50 mph) for our lash-up when all of a sudden – Blam! 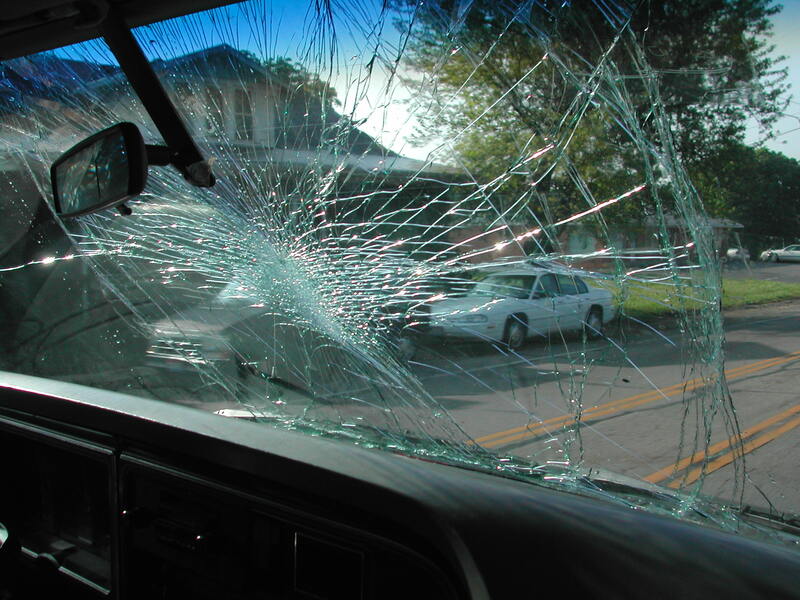 The hood snaps up and smashes into the windshield shattering the center half. The hood completely covers the field of view forward. Bill hits the brakes while I give guidance on distance between the edge of the road shoulder and the right side of the van. The guys behind at first didn’t know why we were stopping but then saw the smashed windshield through the rear window of the van. We latch the hood down and limp on into Sears only to find out the mechanic had gone home and they didn’t open on Sunday until 11:00 AM. Sears says they can have it diagnosed by noon and will call on my cell phone. We leave the van and beat it back to the dorm arriving about 7:00 PM with a 7:30 PM dinner reservation at “Bullwinkles” over in Miamisburg. It’s a 5-minute clean-up and then a caravan of four cars loaded with 18 people. A car full of the four newly minted hams had left earlier for Bullwinkles. At Bullwinkles, we got our usual 2 long tables upstairs and waitresses from last year. After drinks were served, Bill at one table and I at the other table relate the harrowing events of the previous 3 hours. A great time was had by all at Bullwinkles. Afterwards, back at the dorm, we loaded the digital pictures onto Barry’s laptop and held a slide show for all. So ended a day of cold, rain, and bad luck. We slept in and awoke at 8:00 AM. Everyone packed, organized rides, and headed out. It’s a cool sunny day with broken clouds. The four new hams haven’t had enough and head back to the Hamvention. Jeff and Fred stay back to help Bill and I get the van fixed. 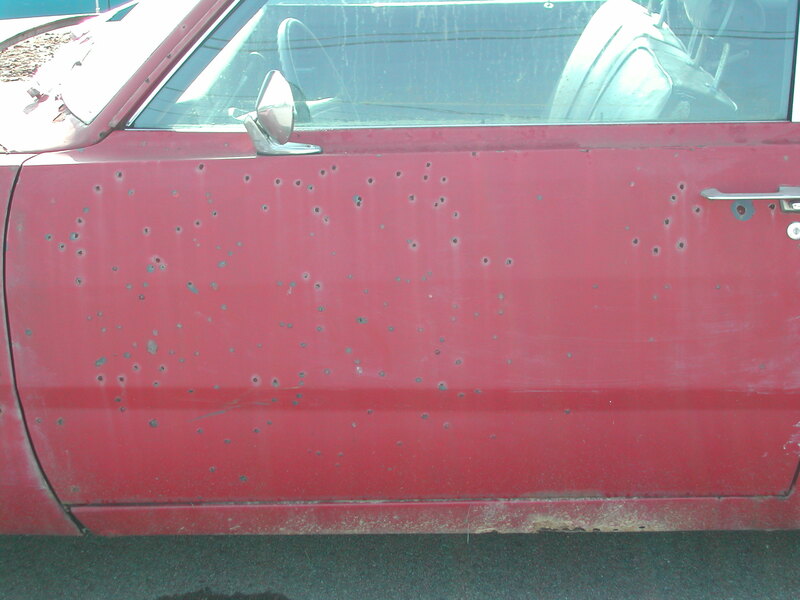 We call around but only one business will replaced the windshield and they want $200 plus $400 extra for Sunday labor. We all go to the Hamvention. The weather is nicer but attendance is very thin. We watch the end of the Hamvention prize drawing while awaiting the call from Sears. Sears calls about 1:00 PM and says the alternator is bad and was replaced. We load up and go to Sears. When we arrive, the mechanic is still buried into the van. Still no battery charging. We start helping (gradually). We get out the Haynes Manual Bryan sent along and dope out the schematic. The Sears Tech takes a break. Jeff starts trouble-shooting with his DVM and the Haynes Manual. He eventually finds a bad connector on the voltage regulator. Borrowing Sears cleaning solvent, wire brush, etc. we soon had it fixed. However, the old regulator was also found to be bad so it was replaced. Now it all worked. I bought some wide clear mylar tape at Sears while Bill paid the repair bill. We were on the road again after taping the inside glass to prevent more glass bits from coming inside the van. Fred and Jeff head for home. Bill and I took the back roads (slowly due to limited visibility thru the shattered windshield) to the Days Inn and check in for the evening. We called the glass shop and got an appointment to replace the windshield at 10:45 AM tomorrow (Monday). Before going to dinner at the nearby Bob Evans café, I pulled out my cell phone and pocket change and tossed it all on the bed. 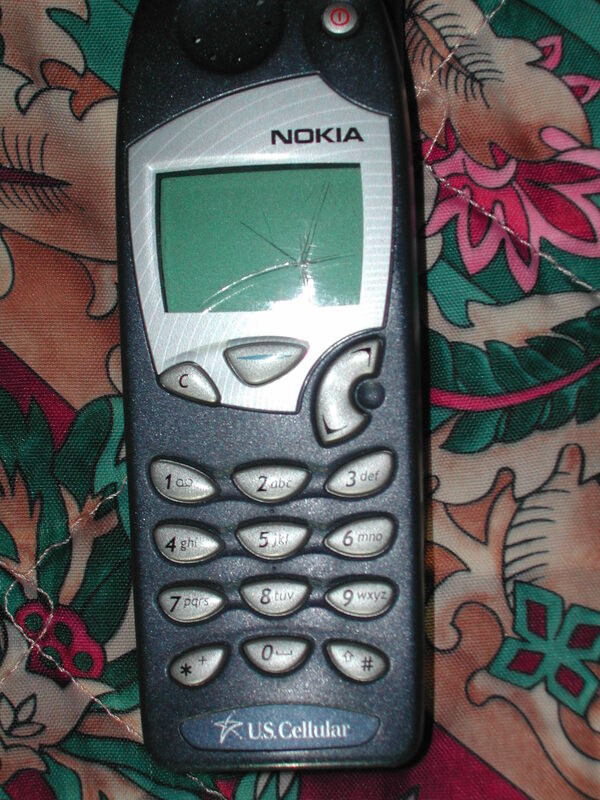 It hit the bed, bounced up and came down on the cell phone breaking the glass window on it. Damn! Do we have some bad luck glass spell on us?! Dinner at Bob Evan’s was delicious. Normally this would be a go-to-work day at Rockwell Collins for both of us. But here we are stuck in Dayton with a crippled van. 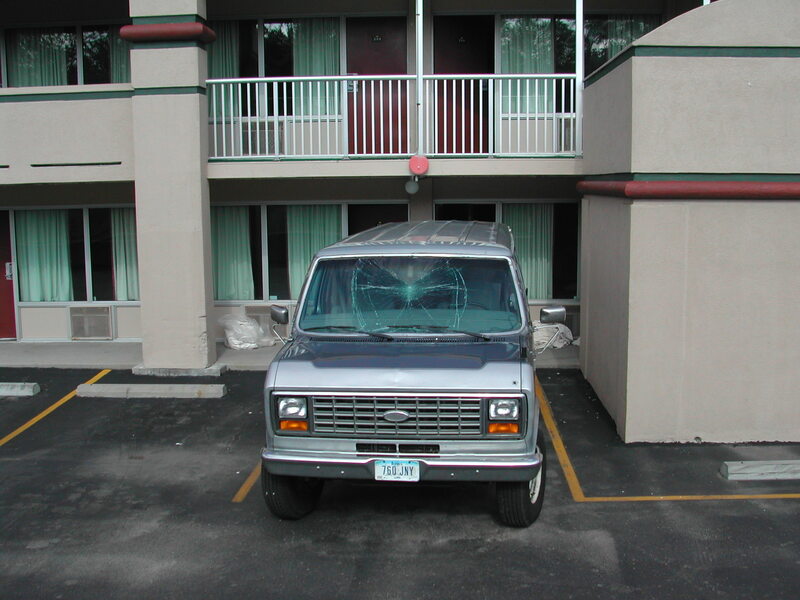 We check out of the motel and go to the Auto Glass shop early to see if they can start on it. It’s 9:00 AM and they take the van in. Bill and I kill time with a visit to a nearby Harbor Freight Store. We are on N. Dixie Ave near the intersection on Needmore Road. I bought some small tools at Harbor Freight. 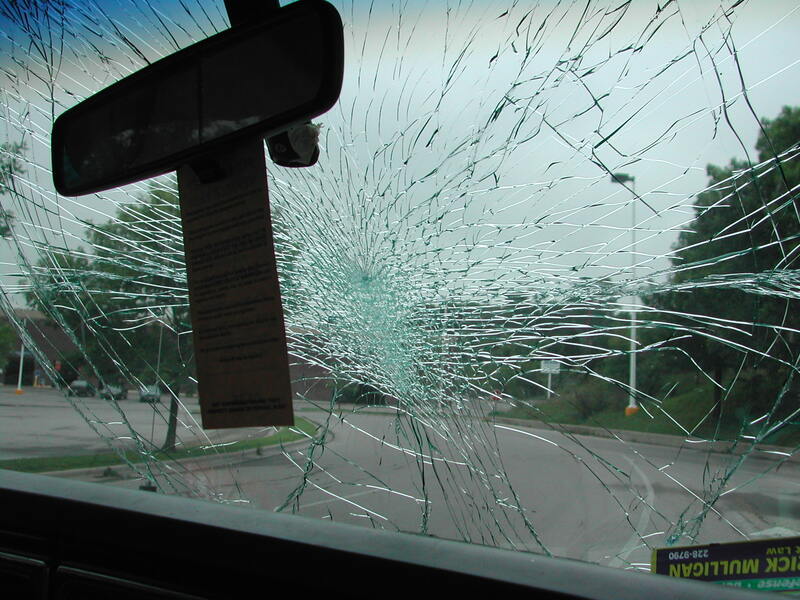 Figure 10 – An Interesting Glass Replacement on this Vehicle! We go back to pick up the van. It looks really nice. As we settle up the bill, the repairman is visiting about operating illegally on 27.505 MHz and working DX with 100 Watts into a 7 element, long boom yagi antenna. We, of course, try to sell him on the idea of a ham ticket instead of all this illegal CB junk. We get out on the interstate pointed for home now. We are feeling good. The van looks good and is running good. The battery voltage is right where it should be at 13.8 Vdc. 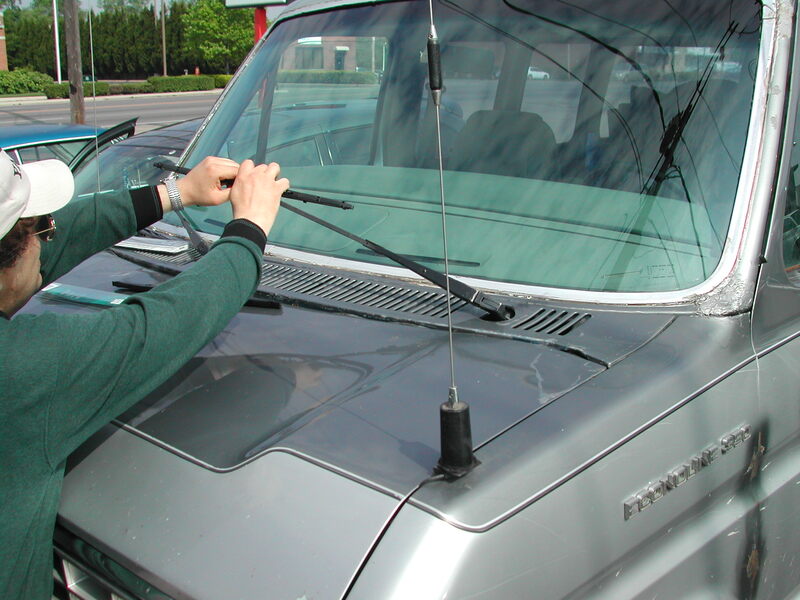 Plus we put some new windshield wipers on to go with the new glass. I’m driving so Bill can get some much-needed rest. And so we cruise along - but stopping frequently to gas up this beast; - and anxious to get back home. The weather is nice and sunny. But this saga is not over yet! Just west of Champaign, Illinois, I’m in the process of passing a truck when the van suddenly starts missing. My first thought was a dry gas tank, so I reached down and switched tanks. No help. I’m rapidly loosing power so I pull over to the side of the road. We get out the voltmeter and stare in disbelief at a reading of 8.5 volts! The battery is discharging again! Do we have a bad battery after all? Bill calls AAA on my cell phone. They send a tow truck out. Takes it an hour to arrive. While we wait, we clean all the electrical connections. 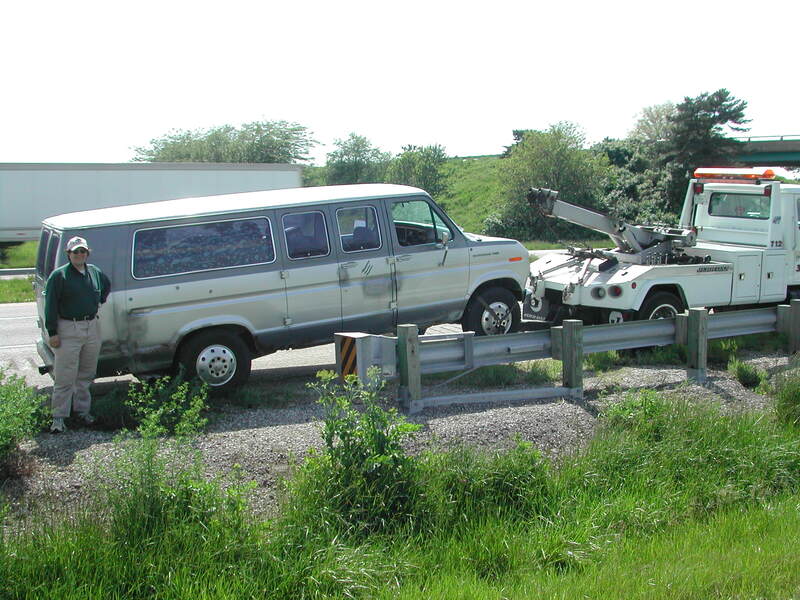 Tow truck hauls us to Sears in Champaign. They test the alternator and find it bad. Next a lengthy discussion ensued about Sears warranty and several phone calls back to the Salem Mall Sears store. It seems they didn’t install a Sears alternator but got one from PEP Boys instead. We maintained as long as Sears did it, it doesn’t matter what source produced the alternator. Finally the store manager agreed and 3 ½ hours later we had a new alternator (warranty replacement) plus a new battery installed and back on the road again. That night we were thankful we installed new windshield wipers as we got caught in a heavy heavy rain around the Quad Cities. It’s 2:00 AM when we arrive home from a much longer than anticipated Dayton Hamvention Odyssey of nearly a week!